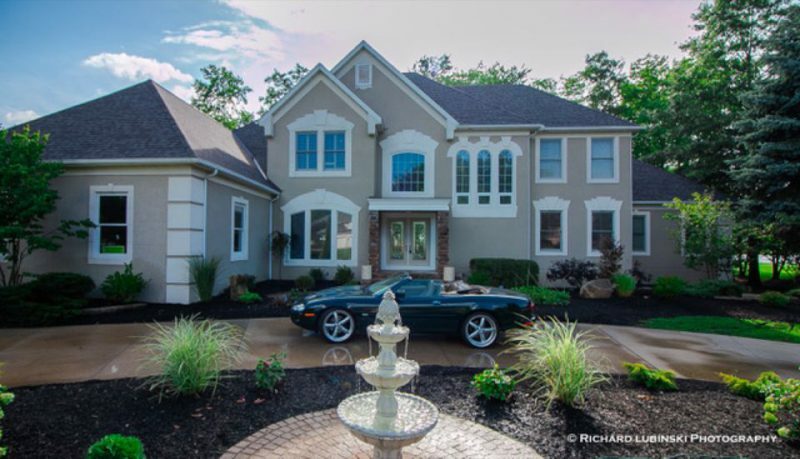 AURORA, Ohio — You don’t have to be a golfer to live in this 5,000-sq. ft. contemporary in Barrington, but it certainly doesn’t hurt. Located on one acre along the Jack Nicklaus-designed course at Barrington Golf Club, the home was built in 1995 and boasts six bedrooms and eight bathrooms (five full). The asking price is $1,350,000. “This fabulous home has had a complete makeover with the highest quality craftsmanship and attention to detail,” Howard Hanna agent Richard Lubinski says in his listing. Rooms filed under “fabulous” include the open kitchen, with a Wolf double-range, granite counters, wood floors, large island and eating area overlooking the backyard. There’s also the entertainment room, complete with vaulted ceiling, skylights, wet bar and access to the deck. A stately library covered in wood is equally impressive. The first-floor master suite comes with a two-story walk-in closet and spa bath with 22-jet shower, Italian travertine flooring and a spiral staircase to a sitting area with fireplace.